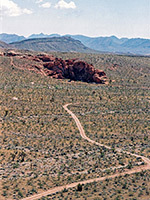 There are many prominent outcrops of deep red eroded sandstone in the hills and desert surrounding Lake Mead, including various places either side of SSR 167, Northshore Road, and quite extensive formations in the Valley of Fire State Park. 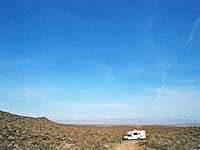 One location less well known is the Whitney Pocket area, which has several high mounds rising starkly above the flat plains of the Mojave Desert northeast of the lake. The pocket is located on BLM land close to I-15 (25 miles away) so could be a good overnight stopping place for those on cross-country journeys though this region has much else to offer with onward routes to the south passing near old mines, petroglyphs, a ghost town (Gold Butte), the eroded formations of Little Finland and many tracks leading to the little visited eastern shoreline of Lake Mead, and also several roads to the east, entering the even less frequented lands of Grand Canyon Parashant National Monument in Arizona. As of December 2016 all this region is part of Gold Butte National Monument. The road to Whitney Pocket starts from exit 112 of I-15, signposted to Riverside, a settlement of a few houses beside a bridge over the slow moving Virgin River. Here the main road turns left and follows the east side of the river to Mesquite, while a narrower, undulating, unsignposted road (Gold Butte Byway, or New Gold Butte Road) branches to the right, passing several farms, irrigated fields and orchards along the river, which flows through quite a wide valley though is largely hidden by a thick band of cottonwood trees and bushes - not much access possible. The pocket is a further 15 miles along the road, which soon turns away from the Virgin Valley and crosses rolling, arid hills with little vegetation, still paved though rather rough in parts; not much maintained. Cacti appear as the elevation increases, most noticeably several species of opuntia and echinocereus that have bright pink/purple flowers in spring, plus a scattering of equally colorful indigo bushes. 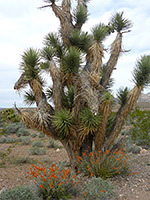 Also quite common are large California barrel cacti, some well over three feet tall. The road passes several places good for (free) camping, descends a little and reaches a 4-way junction. 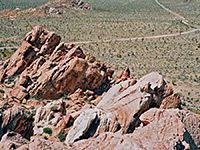 Left is a rougher road through the foothills of the Virgin Mountains then on to Mesquite, right is towards Lake Mead NRA while straight ahead, after a few miles, is Whitney Pocket, the red rocks rising quite abruptly from the sandy desert, here dotted by Joshua trees as well as various types of cacti. The rocks have shades of orange and white mixed with the usual red, all composed of Aztec sandstone (closely related to the much more widespread Navajo sandstone of the Colorado Plateau) stained by iron compounds, and weathered into rounded boulders, cavities, deep fissures and other formations. A few busy weekends may bring many people camping, sightseeing and sometimes shooting but generally the area is quite peaceful, though ATV use has become quite widespread in recent years. The rocks are fun to climb and all the region is good for photography, with interesting eroded formations, and far reaching views to the south, over the lake and distant mountain ranges beyond.